Jack Cole, myself and a civilian volunteer, George, spent three days at Netroots Nation in Pittsburgh. NN is an annual convention for progressive bloggers that grew out of the success of the Daily Kos blog. I was part of a panel called "After the Shooting Stops," which focused on drug policy reform. It included moderator Ryan Grim, Professor Mark Kleiman, libertarian Radly Balko (aka The Agitator) and Professor Jonathan Caulkins. With four panelists, one moderator and Q & A from the audience, we had to keep our comments brief. 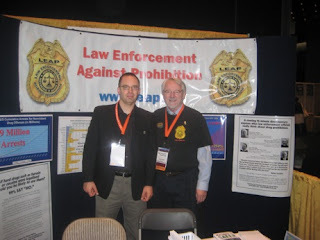 I introduced LEAP and explained the need for ending drug prohibition. A debate ensued with Kleiman and Caulkins opposed to legalizing and regulating drugs, although they both appeared to leave the door open when it came to marijuana reform. Although neither wanted to end drug prohibition, they demonstrated a strong interest in reforming other parts of the U.S. criminal justice system, and I felt they both had some good ideas in that regard. During our last day, Jack went to the RightOnline convention, which was also being held in Pittsburgh. RightOnline is the conservative equivalent of Netroots Nation. He was able to sign up some members there, which speaks to the fact that drug prohibition is an issue with detractors across the political spectrum. All told, LEAP signed up over one hundred new members from both conventions, including some of the most influential bloggers in the United States. Last but not least, these conventions inspired us to start the new blog.